A conventional residential area in Winnenden, a neighbourhood dominated by 1960s housing developments... or is it? No it‘s not, because since 2011 the unusual architecture and construction of the OLS House has surprised visitors to this area. 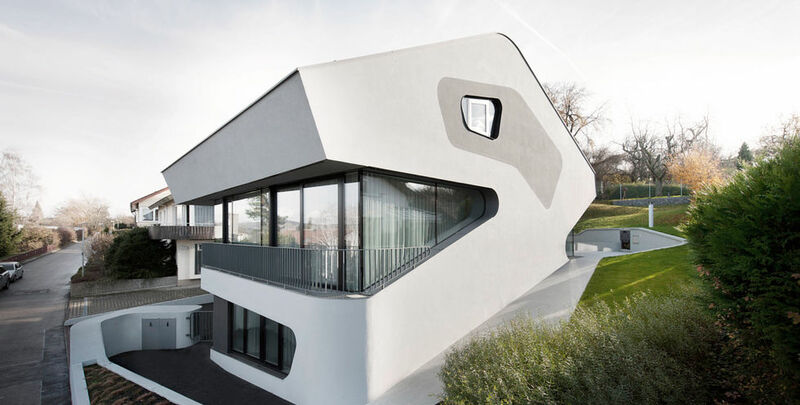 With its gleaming white and soft organic forms, the house looks like a sculpture, clearly set apart from its neighbours. Offering around 300 square meters of living space, the three-storey building has a basement level and a first and second floor. The entry and spa areas are on the basement level, which recedes well back into the slope. 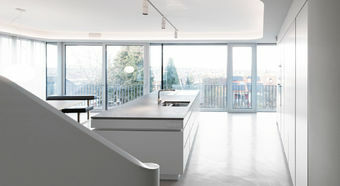 An open living, dining and kitchen area and access to the terrace are on the first floor. To the south, floor-to-ceiling windows open up a view to towards the valley. As well as an unusual exterior, the four-member family also wanted a clear view of Winnenden. 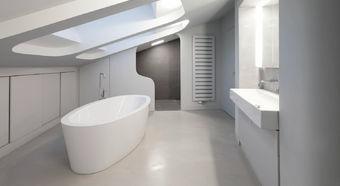 One storey higher are the family’s bedrooms and bathrooms and the two roof terraces connected to them. 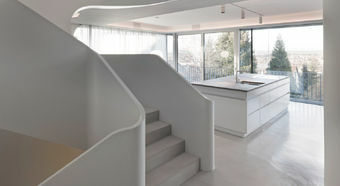 A sculpturally formed staircase at the centre of the house links its three levels and a lift offers barrier-free access to all storeys. The walls’ organic forms combined with the house’s simple outfitting, light, smooth screed floors, white living, kitchen and bathroom furniture, and the JUNG White electronic installation with the classic LS 990 switch design, create an almost futuristic yet calm overall look. 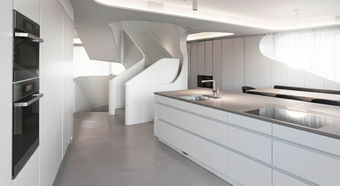 The OLS House has not just a strikingly different look, but also strikingly different energy use. Built as a reinforced concrete structure with a composite thermal insulation system, integrated sun-blinds in front of the windows and interior blinds prevent it from overheating. A pellet boiler combined with a solar power plant heats the house and the heat is distributed through an in-floor heating system. Central ventilation ensures a steady supply of fresh air. Its fittings, furnishing and overall look make the OLS House in Winnenden a very distinctive home – not only in its neighbourhood, but far beyond.